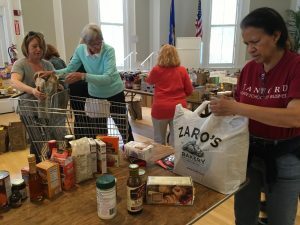 The Westport Woman’s Club’s Food Closet partners each year–on the second Saturday in May–with the National Assn. 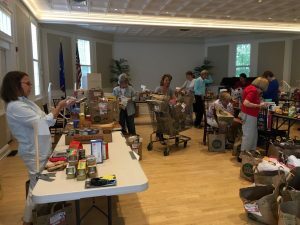 of Letter Carriers “Stamp Out Hunger” Food Drive. 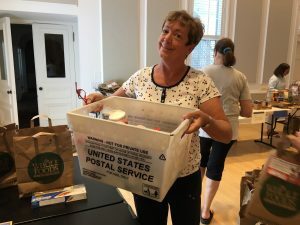 Postal workers collect and deliver bags of food to the WWC’s Bedford Hall. There, WWC volunteers receive and sort the food according to type, remove and discard expired items and transfer the net donations for storage and future distribution to Westporters in need, through Westport’s Dept. of Human Services. Suzan Murphy verifies expiration dates at her category checkpoint before food moves to storage. 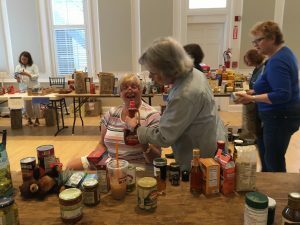 Linda Amos and Barbara Stemmer discover and reject a maple syrup donation with a 1996 expiration date ? Melody James keeps transferring food.